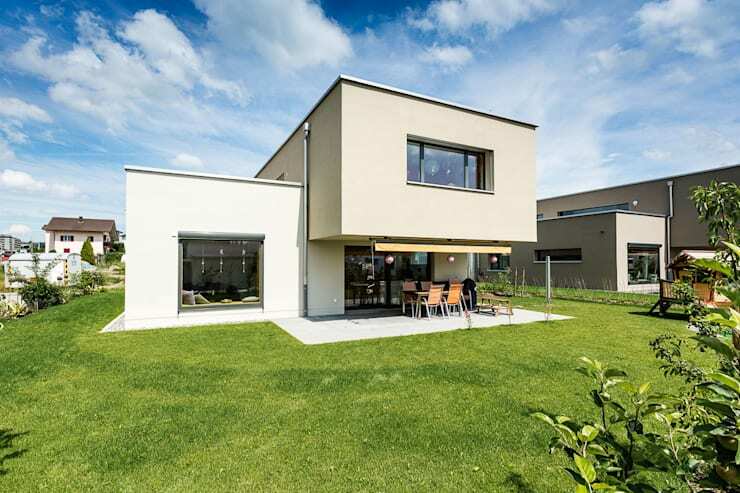 In the town of Oberkirch, Germany, we came across a modern residence surrounded by verdant green lawns and a landscaped garden. Situated in a quiet and friendly neighbourhood, this home is close to all daily needs like shops and schools. 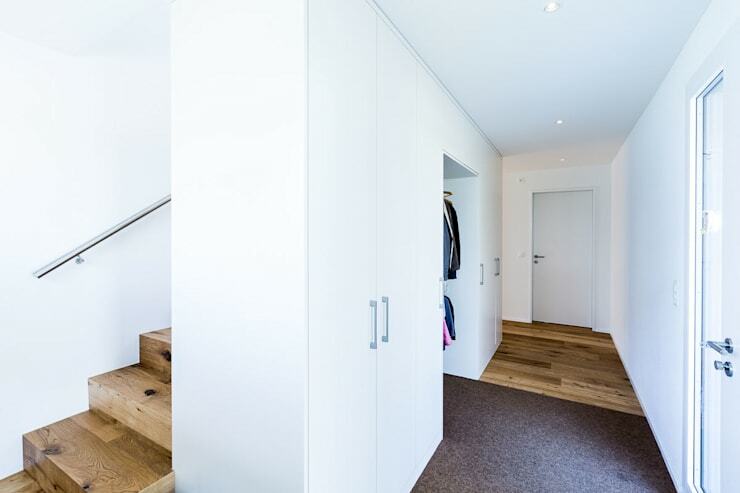 Built by the architects at Hunkeler Partner Architekten AG, this abode makes use of simple, straight lines and peaceful colours to create a cozy and functional living environment. Large glass windows bring in ample sunlight into each room, while wooden elements add warmth here and there. The expansive backyard is especially perfect for enjoying outdoor meals, relaxing with loved ones and admiring the freshness of nature. Simple volumes and the use of creamy white make the structure welcoming and modern. Glass windows have been positioned in a way such that sunlight enters the home but privacy is not hampered. The garage with its black door is sleek and trendy. 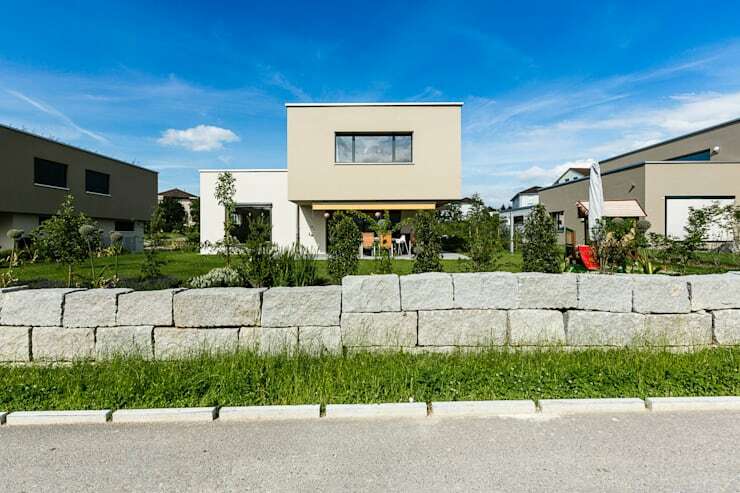 We also love the paved approach and elegantly landscaped garden with pebbles and lush vegetation. The lavish use of white for the walls, ceiling, cabinets and island make the kitchen a bright and serene space. Glossy grey countertops and chrome appliances add a bit of colour, while the wooden floor seems warm and inviting. The dining furniture is simple yet stylish, and complements the floor. 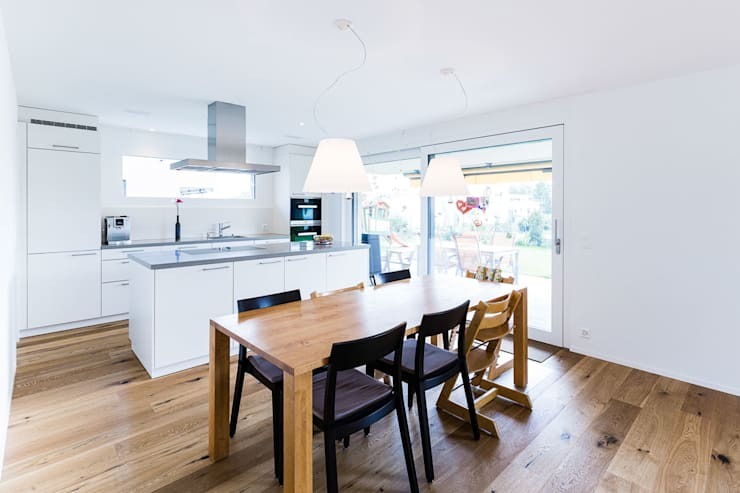 Trendy pendant lights and large glass doors leading to the backyard ensure that the kitchen always stays cheerful and wows with a beautiful view. This sleek yet bright and neat corridor impresses with its classy wood and white combination. The wall on the left conceals the staircase leading upstairs, and features in-built closets and shelves for storing everything and anything. Very smart utilisation of space! A combination of light wooden tones, sandy hues, and lavish doses of smooth white makes the bathroom bright and inviting. 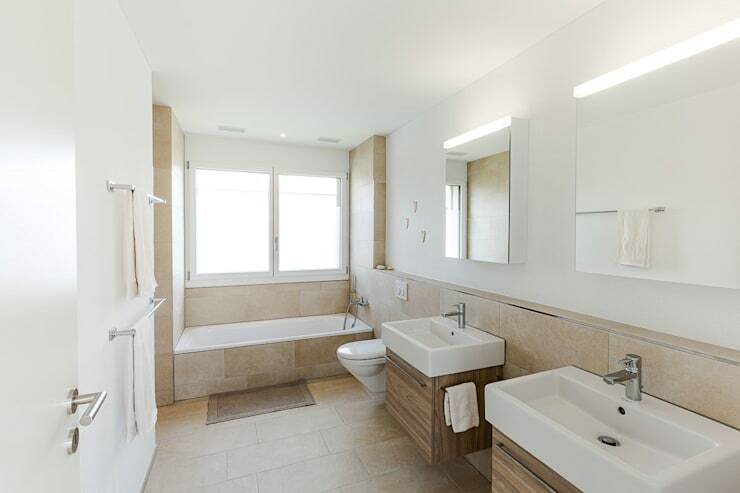 Sleek and fashionable fixtures, large mirrors and a sunny window contribute to the spacious and trendy feel. Wall-mounted rods help in organising robes and towels and save on floor area. Manicured green grass and lively plants make the backyard a serene place to connect with nature. The upper volume of the house projects to create shade for the outdoor dining arrangement, while large glass windows visually integrate the interiors with the exteriors. 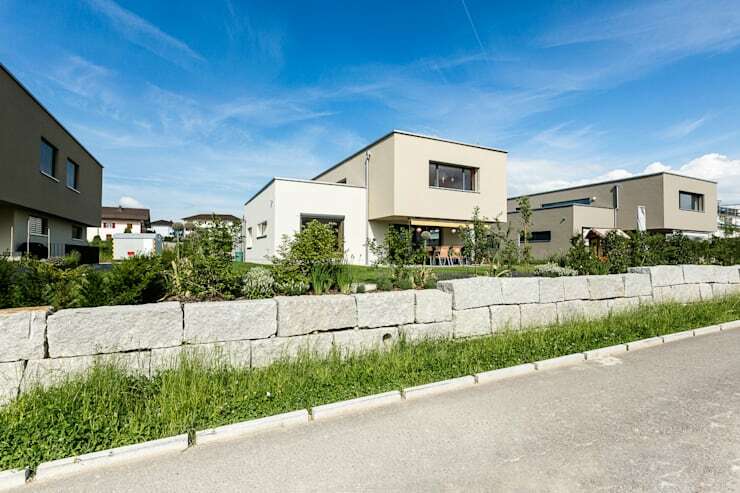 From the street, you can see that the perimeter of the property is restricted by a boundary wall made of large grey stones. Edged with grass, this lends a subtly rustic and countryside appeal to the modern home. Here’s another tour of you need more inspiration - Get the 'Wright' inspiration from this gorgeous home.